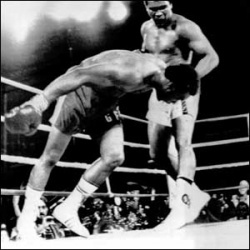 The Rumble in The Jungle was an historic boxing event that took place on October 30, 1974, in Kinshasa, Zaire . It pitted then world Heavyweight champion George Foreman against former world champion and challenger Muhammad Ali, who was looking to become the second fighter ever, after Floyd Patterson, to recover the world's Heavyweight crown. Arguably, it is thought by many to be the greatest fight of the 20th century. Boxing, also called prizefighting (when referring to professional boxing), the sweet science (a common nickname among fans) or the gentleman's sport (used mainly in England), is a sport and martial art in which two participants of similar weight classification fight each other with their fists in a series of one to three-minute intervals called "rounds" There could be 2 to 12 pro rounds. Championships hold 12 rounds. However, there are some 10 rounds championships like legendary & historic gene tunney-jack dempsey bouts. One can win by KO (traditionally), TKO or on points. Amateur boxing consists of 3 to 4 rounds, each lasting 2 minutes. In both Olympic and professional divisions, the combatants avoid their opponent's punches while trying to land punches of their own. Points are awarded for clean, solid blows to the legal area on the front of the opponent's body above the waistline, with straight hits to the head and torso being especially valuable. The fighter with the most points after the scheduled number of rounds is declared the winner. Victory may also be achieved if the opponent is knocked down and unable to get up before the referee counts to ten (a Knockout, or KO) or if the opponent is deemed too injured to continue (a Technical Knockout, or TKO). For record-keeping purposes, a TKO is usually counted as a knockout when calculating the total knockouts. A TKO can occur at any time. Professional boxing can consists of up to 12 rounds. Before the Queensberry rules fights continued indefinitely. Some countries like Australia have 2 and 3 rounds, intended for beginners, some rounds last two minutes. Heavyweight division starts at 201 lbs (91kg), 200 and below is cruiserweight. But any good fighter can enter unlimited heavyweight division. Boxing has been a dominant sport through out the world for hundreds of years and goes in waves of popularity dependent on the success of an indusry icon. Starting with James Braddock "the cinderalla man" in the 1920s boxing has had icons roll through roughly once or twice per decade. In the 1930s big Joe Louis defended the "nazi" Max Schmeling infront of a national radio audience. Jake Lamotta, Rocky Marciano, Floyd Patterson and a handful of others were instantly recognizable in the 1940s and 1950s. Popularity wanned slightly until Muhammed Ali swooped in with a vengance. Both charismatic and talented Ali became a media darling and a boxing sensation. The "rumble in the jungle" as Don King coined it is thought by many to be the crowning moment of boxing in the 20th century. It wasn't until "Iron" Mike Tyson in the late 1980s that boxing would find a new worthy icon. However his out of control nature turned the promising "17 second" knockout star into a public nightmare. None have stepped up since to renew the boxing sensation that has swept the United States for nearly 100 years. Myler, Patrick (1997). A Century of Boxing Greats: Inside the Ring with the Hundred Best Boxers. Robson Books (UK) / Parkwest Publications (US). ISBN 1-86105-258-8. See Talk:Boxing for discussions/comments regarding this article. See Boxing/Aficionados for those who have listed Boxing as an interest. See Talk:Boxing/Aficionados for discussions regarding this interest. This page was last modified on 21 December 2014, at 02:18. This page has been accessed 24,649 times.